Preventive maintenance for air conditioning systems is important to reduce damage and cost in the future. Maintenance checklist is a simple form that gives you the important items need to be checked and the time schedule for the maintenance of every item. We collected some maintenance checklist templates for air conditioners. These checklists are mainly used for split and window air conditioning systems. 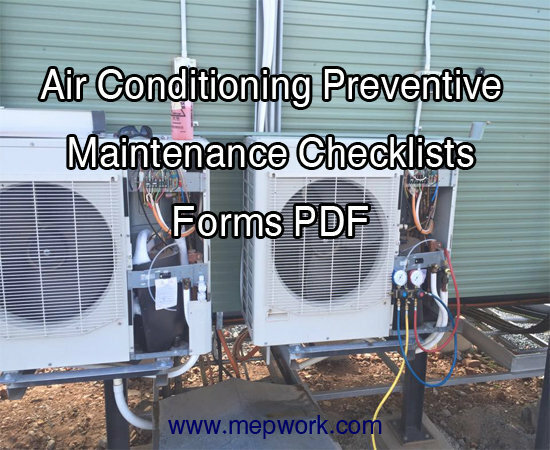 With those pdf checklists you can perform the maintenance for air conditioning without forgetting any item. These forms can be printed in hard copy and used in your future maintenance round! I need building management and Maintenance Manual samples.